A friend of mine saw a bumper sticker, probably from an anti-choice group, with a picture of a fetal ultrasound image and the words, "Woman, behold your son." That is from the Bible and was supposedly said by Jesus to Mary while he was being crucified as he turned her care over to his apostle, John. The thing is that this message, this bumper-sticker, can backfire on these folks because that picture proves that motherhood begins with gestation, not adoption. How I wish that we had been able to avail ourselves of this technology during the EMS. I wonder how many of our parents, once they saw their grandchild in utero, would have re-thought the idea of surrender. I wonder how many of us mothers might not have dug in and fought a bit harder. The bond I felt with my unborn children began the moment I could feel that first little flutter of life. I went with my granddaughter to see an ultrasound of my great-grandson when she was expecting him and I was hooked. When you can see your flesh and blood developing inside you, how much more difficult would it be to surrender? We were not even supposed to be allowed the joy of feeling that life within because we were waiting for that moment when our babies would be born and lost to us. Most of us still, as is natural, were overwhelmed with love as we felt each little kick and shuffle. There is a new bill being introduced on a national level..an "Adoption Support Act" which will offer even more monetary goodies to the saintly adopters and which will allow the Adoption Industry to raid the dwindling Social Security coffers. Most of us EMS mothers are now dependent on that Social Security Income , which many of us paid into for years while working. It's OUR money. That they want to use it for adoption incentives just really rattles my chain, big time. Musing Mother will be blogging more about this issue. To me, this bumper sticker, with its supposed "adopt, don't abort" message is a good one for our needs. It shows us the fact that we are doing something ordained by a higher power than a government or a court. It says, plainly, "behold YOUR," NOT, "behold someone's" child. The insidious methods now being used to try to implement pre-birth agreements and brainwash the mother into seeing the child inside her as belonging to others is becoming more and more prevalent. That is the legacy that we leave if we remain silent about the truth of surrender and its effects. 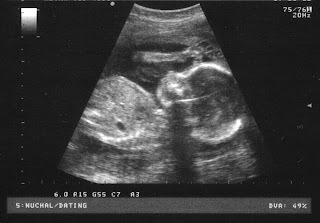 The next time I hear someone claim to be "paper pregnant" I am going to ask to see their ultrasound. Will it show an image of a drawing of a baby inside the PAP? There is no way that hoping/wanting to adopt and expecting a biological child can be compared. I think that is why I enjoyed being pregnant so much with my two oldest. While they were inside me, they were still MINE. I would sit and sleep with my hands over my growing belly as if protecting the life inside me. The pro-adoption rhetoric is growing stronger and the benefits offered to those who prey on the mothers is increasing. We were told to go and remain silent. Now that we have disregarded the instructions, the industry lobbyists are gearing up even more. I think we have scared them. I think they see angry mothers and adult adoptees as a real threat. And they most certainly should. I am out to take them down. I am at my daughter's house, babysitting, but am working on the blog right now. Thanks for this post, Robin. I find it appalling that they believe that throwing more social security money at adoption can fix it, and that they can again get the flow of Russian adoptees moving again, after they shut down all adoptions to the United States due to the many abused and neglected Russian Adoptees here with the final blow being the woman who sent her "forever son" back to Russia...alone and unattended, and with no notice to anyone, clearly an affront to Russia. Robin, the idea of this literally makes me sick, my stomach is queasy just from thinking about the lengths these special interest adoption mongers will go to, to keep young vulnerable mother's providing their babies to their end. How can I help? I find those ultrasound fetal pictures really creepy, and do not wish they had them when I had my kids. I do not think they would have a big effect on grandparents pushing surrender either. Our parents knew quite well we were pregnant, and some of them saw the baby to be surrendered, and that did not change their minds, so how could a blurry picture of a fetus that barely looks human soften their hearts? I can see the need for ultrasound for better medical care, but spare us showing those medical pictures around as if they were cute baby pics. I don't want to see the baby until it is born, being somewhat superstitious about "what if something goes wrong?" I bought very few baby clothes for the kids I raised until after they were born, so maybe that is just me.